When I got out of bed today I made a conscious decision that this would be a "do nothing" day. One of those days where I just kick back, be lazy, and watch TV. For some reason, my plans changed. It was a beautiful day. Even though the temperature was about 80 degrees, there was still no humidity to speak of. It is, after all, still winter! After eating breakfast and watching The View, I stepped out onto the deck and sat down for a very short time. I don't remember the sequence of events, but before I knew it, I'd gotten dressed and pulled the lawnmower out of the shed. I filled the tank with gas and tried to start it. No luck. I tried several times with no luck. Recalling that last year I had the same problem until I replaced the old gas with fresh gas, I actually grabbed an empty gas can and drove to the nearest gas station. This is very, very unusual for me. First of all, I'm an accomplished procrastinator. Second, I don't like to go out in public unless I've showered and am properly dressed. But I realized that I wouldn't actually have to interact with anyone, since I could fill the gas can and pay at the pump with my debit card, so off I went. When I got back home, I emptied the old gas out of the lawnmower. I first tried to siphon the gas from the tank into the gas can. Don't you love the taste of gas fumes in your mouth and lungs? I was so concerned with not getting gas in my mouth that I had no luck with the siphoning. So I broke the law and tipped the lawnmower over until all the gas ran out into the dirt. I put the fresh gas into the mower and, voilà, it started right up! I mowed a very small part of the backyard, and then the hard stuff started. I put up a screen house! In case you have no idea what a screen house is, let me explain. A screen house is a sort of tent with a regular tent-type top and walls made of screen. 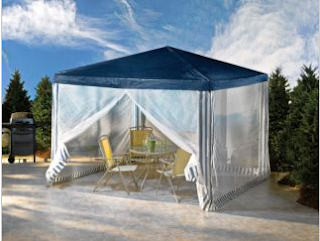 This allows someone who lives in bug-infested central Texas to enjoy her backyard in the summer without having to slather herself with a bug repellent, probable-carcinogenic, toxic substance. I was going to include a picture of said screen house, but the lighting and my camera phone were not agreeable to doing so this evening. Here, instead, is a photo from the website where I ordered it. I got the screen house up with little trouble. The biggest problem I had was that the people/person who packed the screen house in the box folded the actual screen house (fabric) inside out, so the first time I put it on the frame it was inside out. That was easily fixed. I didn't notice the time when I started, nor when I finished, so I can't tell you how long it took. It didn't seem like more than an hour. When I finished the screen house I mowed a little more of the backyard. I didn't mow the whole thing because, hey, I did enough work for one day! Once again I forgot that I have a self-propelled lawnmower, so I pushed and pushed the mower through the tall grass and weeds! When I remembered the self-propelled part, the mowing went faster, but I looked quite silly at times when I got to the end of a row of mowing and forgot to release the speed lever! Now I'll be able to go out and sit in the backyard and read, or just relax, without having to battle the bugs. That is, until the first strong wind blows my new screen house into Oklahoma. Tomorrow I plan to finish mowing the backyard and then mow the front yard, as well. The front yard isn't as overgrown as the backyard, but there are quite a lot of dandelions that need to be dead! Of course, just because I'm planning to mow doesn't mean it will actually happen. As I said, I'm an accomplished procrastinator. By the way, my brother, who lives in Oregon, sent me pictures of the snow that fell at his home yesterday. He's shoveling snow. I'm mowing lawns.